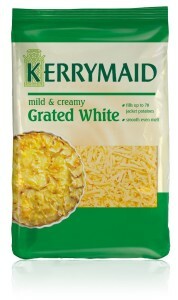 Kerrymaid Grated White is extremely versatile and helps save time in the kitchen by providing chefs with a more even melt than standard cheddars, leading to less oiling out and giving a more visually appealing end product. Kerrymaid Grated White can be used as a topping, sandwich filling and as a key ingredient in dishes such as pasta and moussaka. Watch Kerrymaid development chef Lee Williams demonstrate the versatility and convenience of Kerrymaid portfolio through a range of different uses and professional applications.